UPDATE: I received a note from a NASA engineer that the final flight DHU was made by SEAKR Engineering rather then Space Micro. It turns out MIT pursued 2 different DHU systems in the design of TESS. The Space Micro IPC 7000 was referred to as the DHU and a system by SEAKR (the Athena-3) was selected as the ADHU (Alternate Data Handling Unit). Apparently MIT wasn’t sure which would be best so essentially characterized both (and most documentation from early on shows the Space Micro system). In the end however, the SEAKR Athena-3 Single Board computer was selected. If all goes well, in a few days the NASA TESS (Transiting Exoplanet Survey Satellite) will be launched on a SpaceX Falcon 9 rocket to startits mission to survey a large portion of the sky for possibly Earth-like planets. TESS’s finds will make great candidates for further study by either Hubble, or JWST (when it finally launches). While TESS can see transiting planets (the dimming of a star as an exoplanet passes in front of it) it cannot determine much about its composition, or the composition of its atmosphere. However, having a list of exoplanets to further check out, especially Earth-sized ones, it’s a big help. 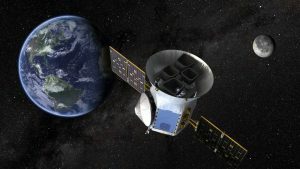 TESS was created as part of the NASA Medium Class Explorers Program (MIDEX) which is for mission up to around $200 Million total cost to NASA (not including launch). TESS itself cost about $75 million (developed in large part by MIT and built by Orbital-ATK on their LEOStar-2 Platform) and the launch services contract was $87 Million with the remainder taken by operations and contingency funding. That makes this one of the least expensive NASA missions, but one that has engendered much more public interest then its cost suggests. Finding alien worlds captivates people hearts and minds. So what is at the heart of the TESS orbiter? Obviously the premier technology is its 4 cameras that will scan the sky, but the computer that powers these is no less interesting. The 4 cameras are interfaced to a Data Handling Unit (DHU). Initially the DHU was to be the Space Micro IPC-7000 computer. 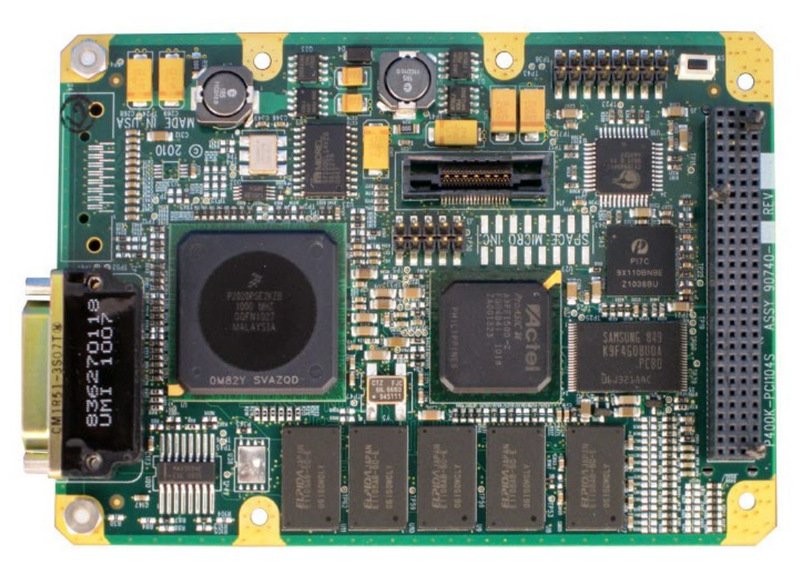 The IPC-7000 consists of a TI TMS320C67xx 32-bit DSP and a pair of Xilinx Virtex-7 FPGAS. They handle all the pre-processing of the imagery collected by the cameras, making it into a format that is easily transmitted back to earth. The rest of the spacecraft functions (such as actually sending/storing the data and other space craft house-keeping) is handled by a Space Micro Proton 400k SBC. The Proton 400k is based on a Freescale 2020 1GHz Dual Core PowerPC processor made on a 0.45u process.. Each PowerPC e500v2 core has a 7-stage pipeline with 32K of I-cache and 32K of D-Cache and shares a single 512K L2 Cache. The computer also containing a pair of 192GB solid state memory boards for buffering imagery data (data is relayed to Earth only once per orbit, so it needs to store data from around 14 days). The final flight version of TESS switched to an ADHU made by SEAKR Engineering. This uses a very similar setup but a bit less powerful processor. The heart of the ADHU is the Freescale P2010 e500 processor at 1066MHz with 1GB of DDR2 RAM and 1-4GB of Flash. 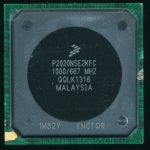 This is the single core version of the P2020 used in the initial Proton 400k. The ADHU also includes a RCC5 triple Xilinx Virtex-5 FPGA board to handle additional camera processing functions (and anything else not handled by the P2010 processor). Solid state storage is a Gen 3 FMC also by SEAKR, containing 3 boards with a total of 192GB of Flash. The ADHU handled all of the science, processing the raw camera data into useful science data and handling the sending of data to the 100-125MBit/sec Ka-band transmitter. 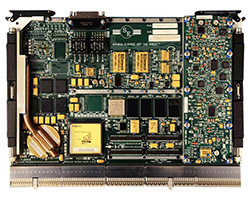 It also supplies some star reference information used by the MAU (Master Avionics Unit) computer to provide finer attitude control of the satellite. The MAU is the LeoStar-2 Satellites main computer, and handles all the mechanics of flying the spacecraft outside of the science work done by the ADHU. In many ways this is a very advanced processor compared to the RAD750 processors we often see on large scale NASA missions. The Freescale 2020/2010 is not an inherently radiation hardened design, however both Space Micro and SEAKR implements many radiation mitigating designs in the system design to compensate for this. It is not as robust as the RAD750 but it is a $75 million earth satellite with a target mission life of 2-years so it doesn’t need to be. The 2020 processor does give TESS tremendous processing power for a scientific satellite, allowing for a lot of pre-processing of the imagery. This allows TESS to handle much of the grunt work, and send scientists here on Earth only the very best data, in a format that is the most useful to them. This is not true. Space Micro did not deliver a flight unit to NASA. TESS has a computer from SEAKR Engineering.